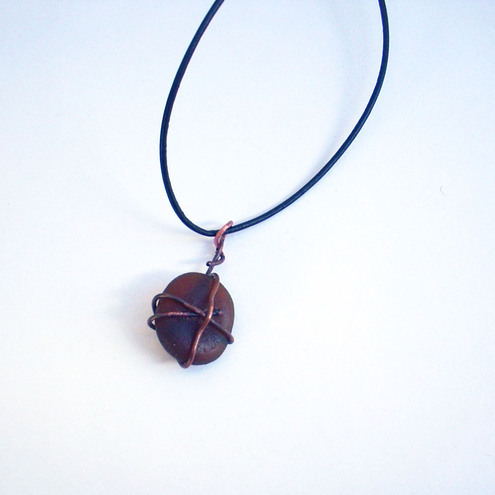 Folksy :: Buy "Beach Amulet Surfer Pendant"
A dark brown, beautifully symmetrical oval of sea glass wrapped in oxidised copper wire and hung on black leather thong. I always melt the end of my wires into a small blob before wrapping and this oxidises the wire, sometimes I clean it off but I like the effect on the copper so I've left it there. As I work the wire bits of it flake off to reveal really pink clean wire, so you get a nice contrast. The effect is of something dug out of the ground and I think the crossed wires look as if they might have a ritual significance. They don't of course it's just the way the wires go to give the least amount of wire across the glass. This is quite masculine and looks vaguely celtic or saxon, (it's also suitable for girls of course). The pendant hangs on a fine, 1mm diameter, black leather thong which is adjustable for length to a maximum of about 600mm or 24". It should fit over most heads! Folksy :: Buy "Reversible natural pendant"
Folksy :: Buy "Tiger Lampwork Necklace"
Folksy :: Buy "Summertime Flower Necklace V2"
Sea Glass and Recycled Silver Pendant on Flickr - Photo Sharing!